The cool thing is that as soon as svn packages appear for suse, we can regularly build cd's to use as a demo. Thank you. I'm trying to build the KDE 4.2.2 on the previous chance but I wonder it should be OK or not because I have a dependency problem regarding default KDE 4.1.3. I will try it now. SUSEStudio is an awesome tools. I'm trying to build something like this too. But adding little bit more repositories. Please, say can you add XOrg repository (with name "X" in the list), or I am the one who has problem to install latest Xorg packages? Nice one Cornelius. I'll have to check this out when I have some time - and some space on a machine. It looks like a very neat service. @CrossBlade: You can add additional repositories by clicking on the "import repositories" link on the repository page. @segendum: You don't need space on a machine. With Studio you can build and test in your web browser. 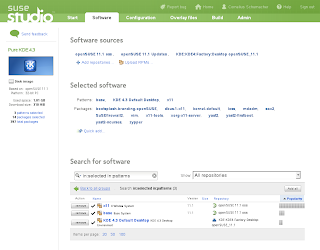 Suse Studio is really nice, congratulations for the release! When booting, I get an error message that the kernel image "gfxboot.com" can't be found, and I'm thrown into a console where I have to manually type "Pure_KDE4.3" to make it boot. I have a graphic driver problem: Even though I have a standard Intel® GM45 Express Chipset, the boot splash screen doesn't work, I get weird artifacts. Later, the KDE session worked again, but the window title bars hat artifacts as well. Mounting partition does not work, I get a "PermssionDeniedByPolicy" error from Hal or PolicyKit. Therefore, I can't access my disk with this live CD. "You don't need space on a machine. With Studio you can build and test in your web browser." Wow. That's pretty neat and you can apply it to all kinds of software set up as well, not just KDE. For those wanting to set up a system for a purpose it's far better than mucking around in a package manager all day.